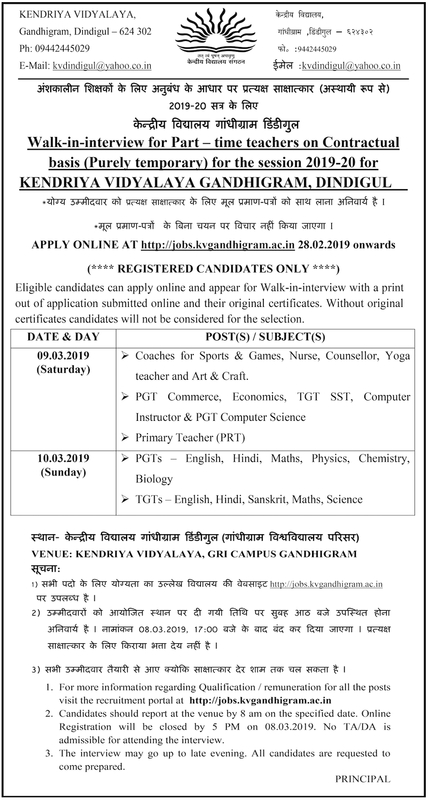 This year Kendriya Vidyalaya Gandhigram Dindigul published a advertisement for Contractual Teachers. PGT (Math, Physics, Biology, Chemistry, English, Hindi), TGT (Math, Science, English, Hindi, Sanskrit) and PRT on Sun, 10.03.2019. The online registration will close on 08.03.2019 at 05:00 PM. Report to the venue at 08:00 AM on the specified dates. Interview may go upto late evening. Candidates are advised to come prepared. Bring the duly signed print out of the online application. Affix latest passport size photograph. Carry all supporting certificates (Education + Experience) in original plus one xerox copy.